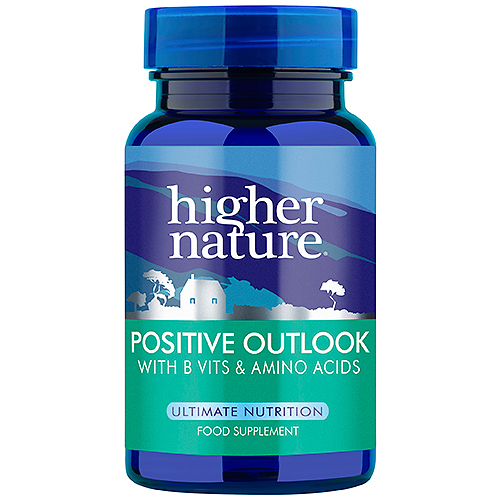 This Positive Outlook formula provides B Vitamins and amino acids, including Glutamine, Tyrosine and 5HTP. These ingredients help maintain healthy levels of the mind’s most important neurotransmitters, serotonin, dopamine and noradrenaline - to promote feelings of positivity and for optimum wellbeing. Adults: Take 2 capsules, once or twice a day. Children over 6 years: Take one a day on an empty stomach. Not advisable if pregnant, or in cases of melanoma, schizophrenia, high-blood pressure, or if taking fenfluramine, anti-depressants, or MAO inhibitor drugs. Consult your healthcare provider if taking medication. Glucose is used in the manufacture of the L-Glutamine. Below are reviews of Positive Outlook - Mood Balancer - 180 Vegicaps by bodykind customers. If you have tried this product we'd love to hear what you think so please leave a review. 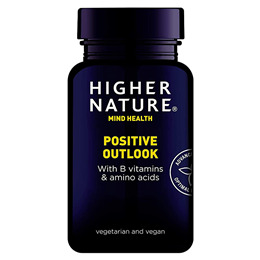 This Positive Outlook formula provides B Vitamins and amino acids, including Glutamine, Tyrosine and 5HTP, to help maintain healthy levels of the minds most important neurotransmitters – for feeling good and for optimum wellbeing.